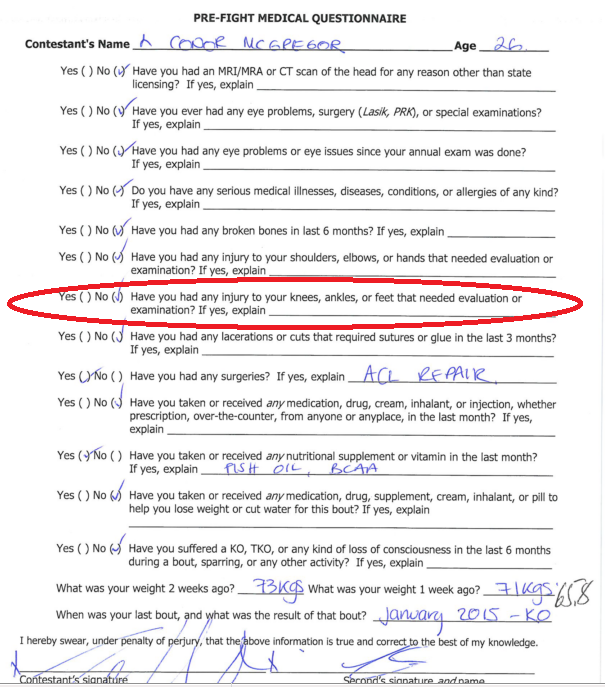 If the Nick Diaz saga and the Manny Pacquiao lawsuits have not gotten the point across let me take a stab at it, lying, under oath, on a pre-bout medical questionnaire can come with a host of legal consequences such as lawsuits, perjury charges, suspensions, fines and even convictions for criminal fraud. Conor McGregor may be the latest member to test these legal waters. Last week McGregor revealed during a fan Q and A period that “fourteen weeks before the fight (UFC 189) I tore 80 percent of my ACL“. Was this profound injury healed by the time of the bout? Apparently not with McGregor going on to note “I went into that fight and I beat Chad on one leg“. An admirable feat. He does reveal that he had an ACL surgical repair which presumably relates to his 2013 surgery, not this recent reported injury. McGregor is known for his hyperbole. Perhaps he was exaggerating matters in his recent Q and A session with fans where he revealed this injury. If so then no harm no foul. Or perhaps his 80% ACL Tear did not “need evaluation or examination” which would make the answer truthful but this is hard to imagine. If this is not hyperbole, however, and he was not candid with the NSAC then he may just find himself as the latest athlete forced to answer for his under oath representations to the regulator. The consequences for dishonesty with regulatory filings are not academic. For McGregor’s sake, hopefully his comments were nothing more than hyperbole and he does not become the latest focal point of the legal world colliding with combat sports regulation.